In November 2008, I predicted that direct-to-consumer (DTC) spending by the pharmaceutical industry will decrease by 11% in 2009 (see chart on left and post here). At that time, Bob Ehrlich of DTC Perspectives was predicting a 6-8% decrease. "John," Ehrlich said in a comment to my post, "the difference between our estimates is really just one brand being advertised or not. So, if we get one additional launch or one brand decides to stop DTC then that will determine who is closer. So toss a coin on you or me." 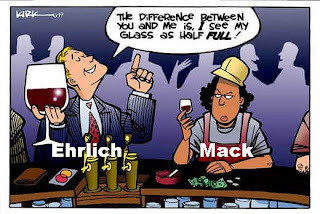 It appears that Ehrlich has now revised his estimate upward. "I expect a decline of about 10% [my emphasis] in total DTC in 2009 as drug marketing budgets are cut to protect profit," says Ehrlich in today's post to his blog. 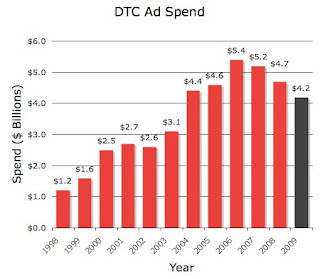 BTW, the majority (56%) of respondents to my "Future of Rx DTC Advertising" survey believe DTC spending will decline in 2009 and a full 22% believe it will decline by more than 10%! If you haven't taken this survey yet, please do and let me know what you think. After taking the survey, you will be able to see a de-identified summary of the results to date. The survey is online here. It's not as rare as you may think for Bob and me to agree. The difference between us is that Bob sees the DTC glass half full and I see it half empty. Whatever. What's important is to look at what's in the glass and decide if it's drinkable or not! Recently, a few drug company CEOs seem to think the DTC Kool Aid -- at least the broadcast TV version -- is not as potable as it used to be (see here). Bob thinks this is mostly due to economics -- "Despite some political considerations most big drug companies will make DTC television decisions entirely on a financial return basis," he says. Yes, in good times it's easy to spend money even knowing the return stinks, but in bad times you'll take heat for wasting money -- but it's still the same waste of money it's always been! You know what I mean. When you got tons of dollars coming in, you don't stop and analyze every cent going out. You may not be spending those cents as wisely as you should, but what the hell! You're on TV! Now, when prescriptions are decreasing and you're laying off R&D people, other people (ie, investors) are going to be looking at those cents and you better spend them wisely. Face it. CEOs only respond to investor concerns. The TV DTC budget is a fat purple cow as far as they are concerned. Off with its head! Bob makes a point that drug companies will now get better bang for each buck (or cent) they spend on TV DTC..."we may see big DTC brands spending less than in 2008 but getting more GRP’s in 2009." Probably. Will investors buy into that argument though? That's like Pfizer re-organizing their research effort to make it more efficient. In the end, however, investors demanded cuts, not efficiency. And off came some R&D "heads!" Yet Bob also suggests that some drug companies may cut TV DTC because of "better ROI in other marketing tactics." And among those other tactics is eMarketing! Now is the time for all good ePharma PioneersTM to come together, join my ePharma Pioneer ClubTM, and give aid to the failing pharma marketing industry! More on that later! With dollars being used to acquire other companies, less people going into to see physicians and patients cutting back on Rx's because of tight dollars it's easy to see how DTC could be cut so much. Most pharma companies are run by people who do not have a marketing background and are suspect that marketing can add value to the company. They also feel that this is a time to follow an Ostrich and stick your head in the ground when it comes to new DTC initiatives. It's important to note that not all categories are impacted equally. While the overall pie is shrinking, the shift from traditional media to the web continues to happen. Interactive is continuing to get a larger share of the DTC budget, and according to our own advertiser survey (n=75) will increase in 2009. I am writing up the results of my survey for Pharma Marketing News. Want to share your results with me for publication?